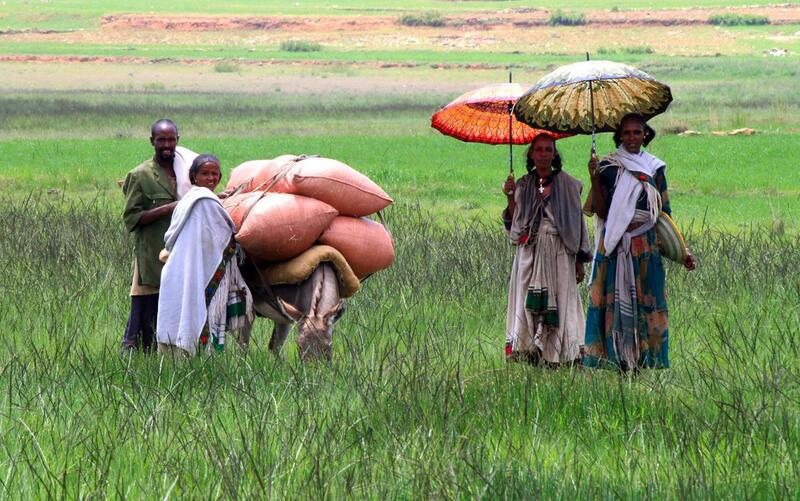 With its 91 million people, Ethiopia is one of the most highly populated countries in Africa. 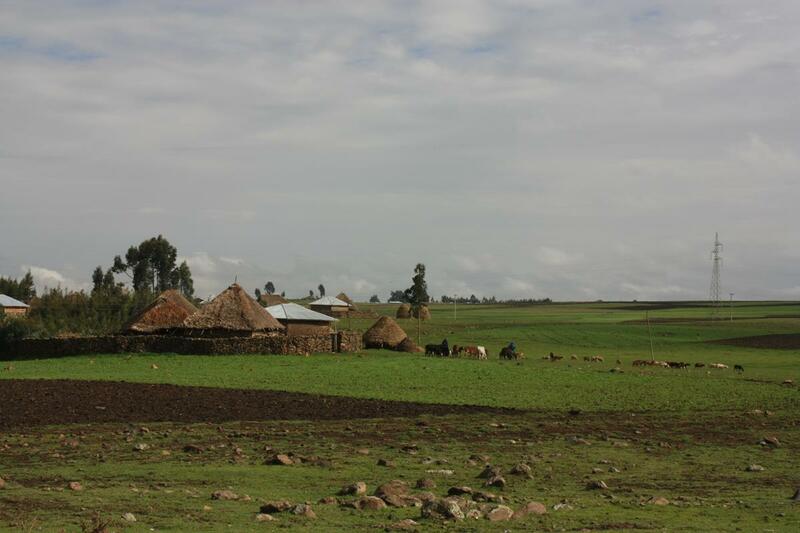 The rural areas are a continuous, terraced farmland; most of the people operating at subsistence level, using terraces that have perhaps been there for thousands of years, cultivating even the steepest slopes. We think that the extent of undeveloped countryside is why we have seen the most amazing bird life throughout. Even the highest slopes are cultivated. The road towards Lalibela winds through an impressive mountainous area and upon descending the Mezezo Escarpment (3 200m altitude) to the Awash Valley we were lucky enough to see a rare troop of Gelada monkeys, with their long hair and red faces; the large male aggressively asserting his dominance over scraps of food tossed out by passing motorists! 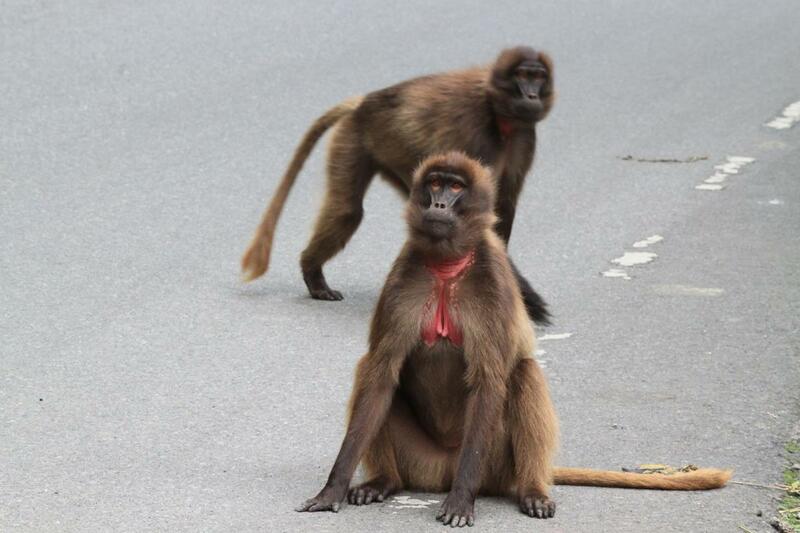 These baboon sized monkeys are endemic to the Ethiopian highlands. 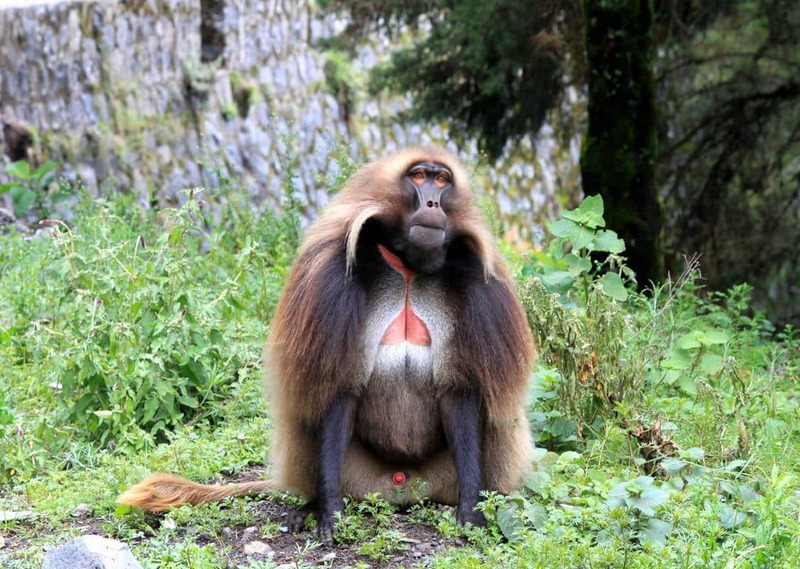 A big and dominant male Gelada. After the beautiful terraced mountain slopes it seemed strange to next pass through a forested area. The Gumtree saplings are used for building ‘wattle and daub’ houses in areas where stone is not available. 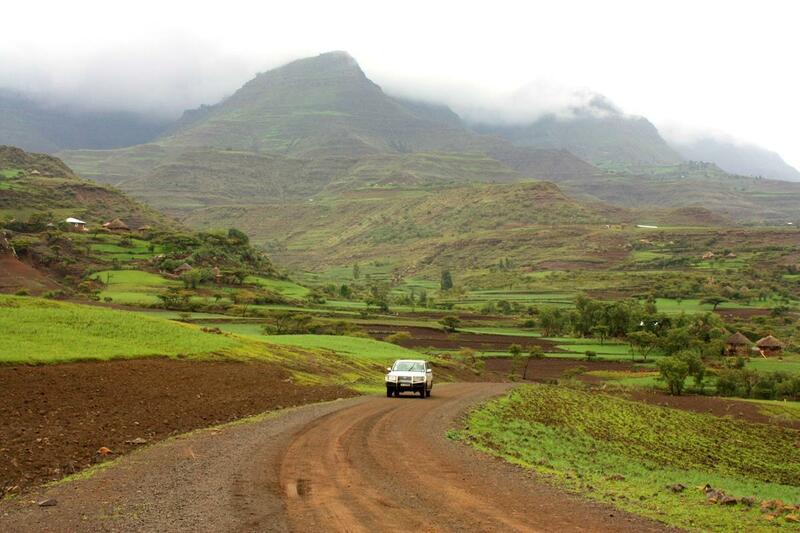 The road from Addis to Lake Hayk is most probably the best we have travelled thus far in Ethiopia. Despite this, driving is slow because of the many villages, each with livestock and umpteen people on the road. Camels are an ordinary sight in Ethiopia, being used as beasts of burden and for meat (but not for Christians) and milk. To us they remain a stately novelty. Camels are a common sight in Ethiopia. Between Robit and Efesan the landscape dried and close to Kemissie we passed the Barkana wetland, which is a seasonal green floodplain grazed by thousands of cattle. So many in fact that it almost looked like the migration in the Serengeti! We camped at Lake Hayk, which, being surrounded by hills, is not visible from afar and has amazing bird life. The local fishermen on their rustic wooden boats add to the charm. 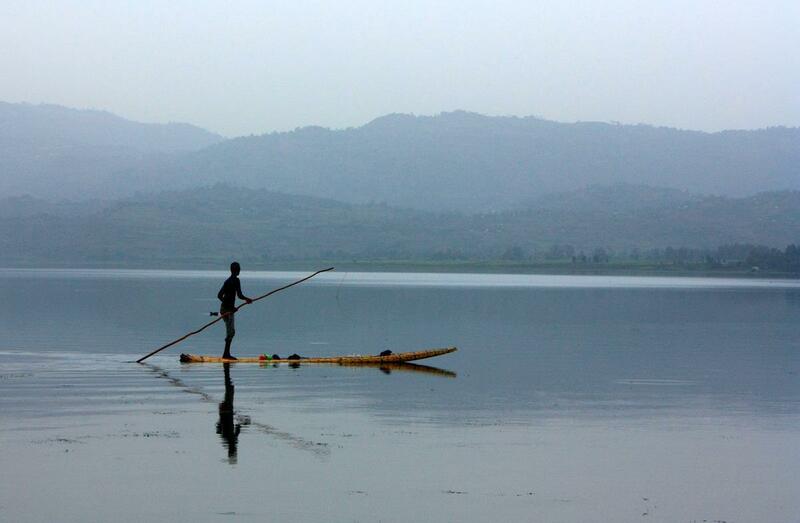 Local fishermen add to the charm of Lake Hayk. 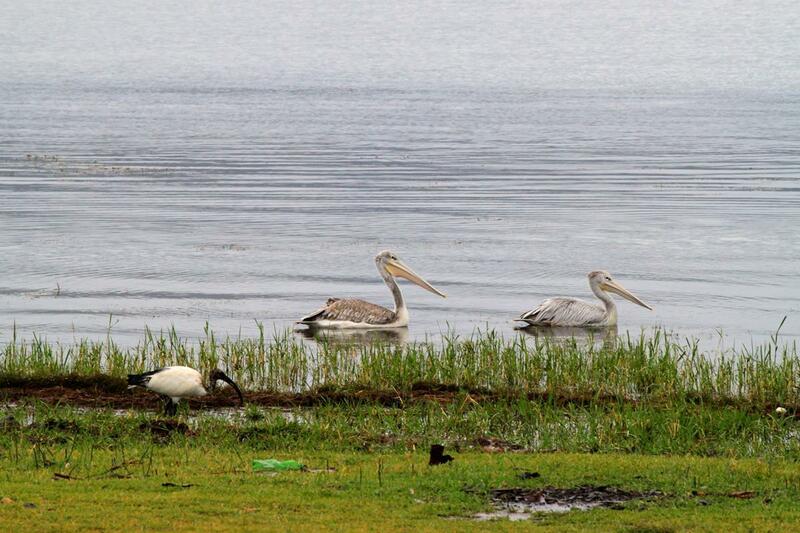 Lake Hayk has a prolific bird life. Now driving on gravel we traversed some dramatic countryside with majestic scenery that reminded us of the most beautiful of European mountains. The last leg of our journey to Lalibela was completed in rain, reminding us that the wet season was now well established, with the farmers ploughing and sowing. 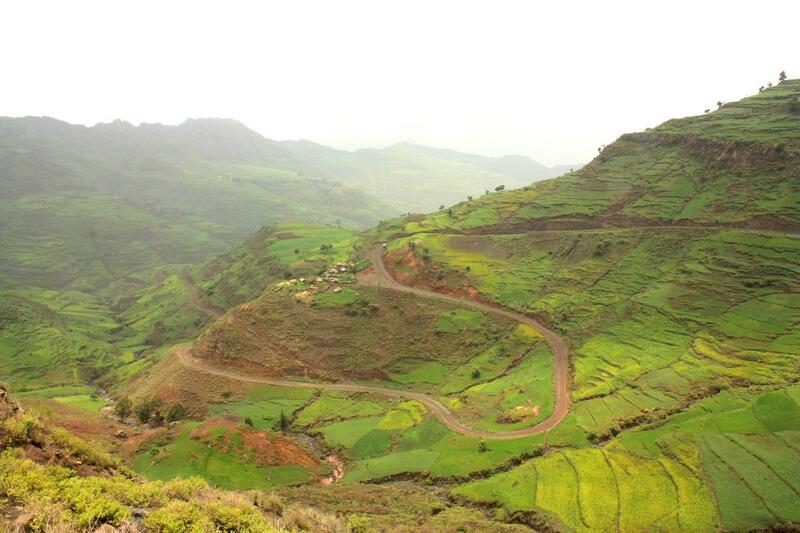 The Ethiopian highlands are majestic. 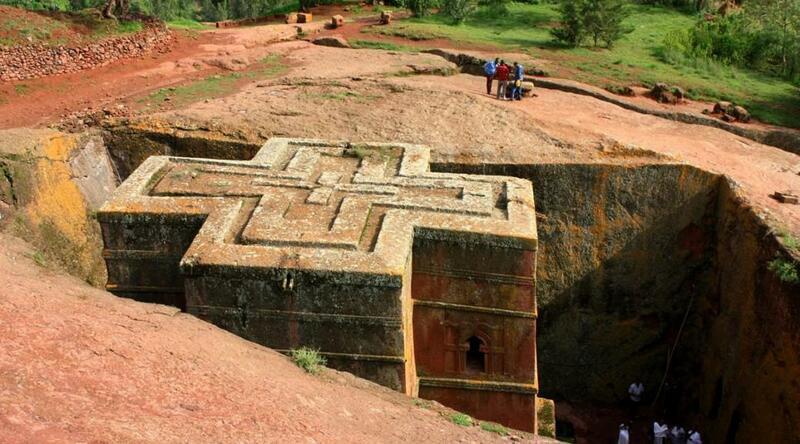 Lalibela was the Ethiopian capital between the 10th to mid 13th century. Set at an altitude of 2630m in the Lasta Mountains, it is known for its two clusters of rock-hewn churches, carved about 800 years ago out of solid stone below ground level. These churches must be one of the man-made wonders of the world. 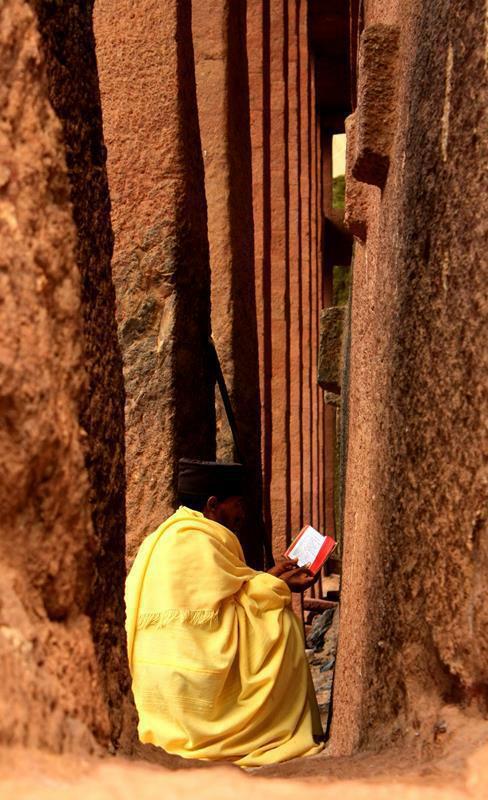 A priest, sitting face to the wall of one of the churches, reading the bible. 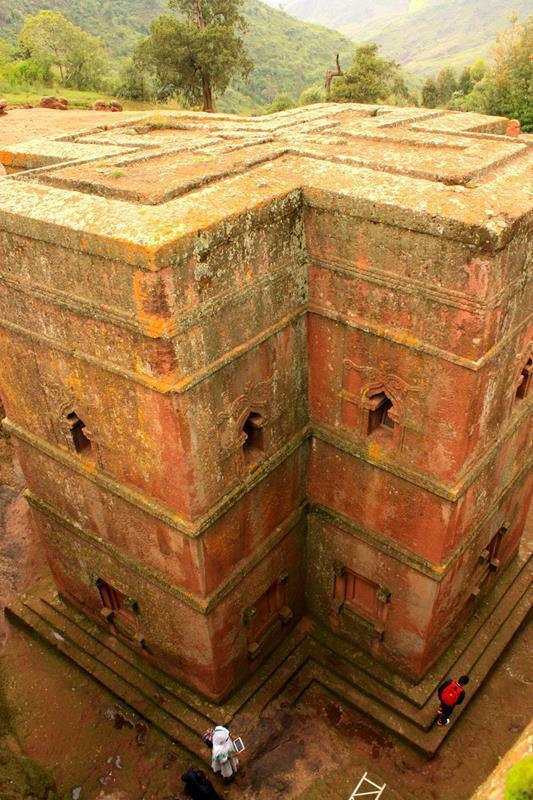 Lalibela’s rock-hewn churches are one of the man-made wonders of the world. 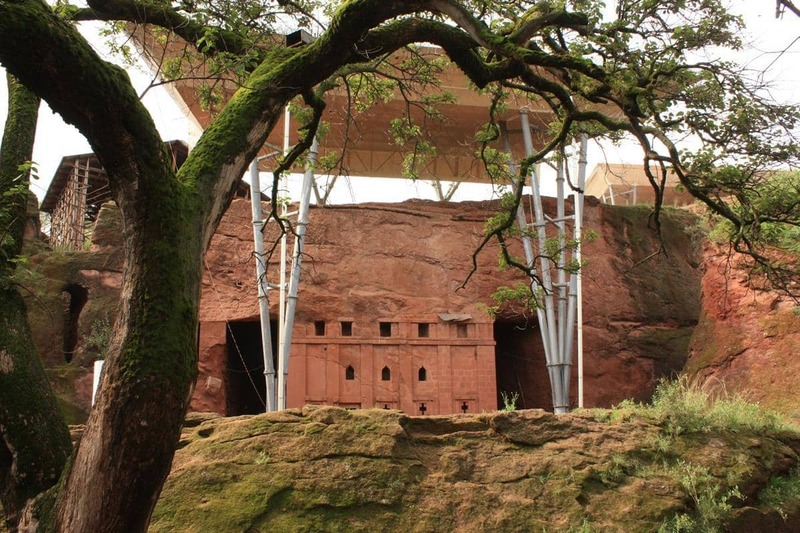 These are just 13 of the 300 rock-hewn churches throughout Ethiopia, but are the most spectacular. The roofs of the churches, some over 10 metres above their floor, are formed from the top layer of their founding rock, which was hollowed out around and within to form the churches themselves; each with supporting pillars and an interior suggesting that the structure was built up from its base, not chiselled out from above. The are chiseled out from their founding rock. 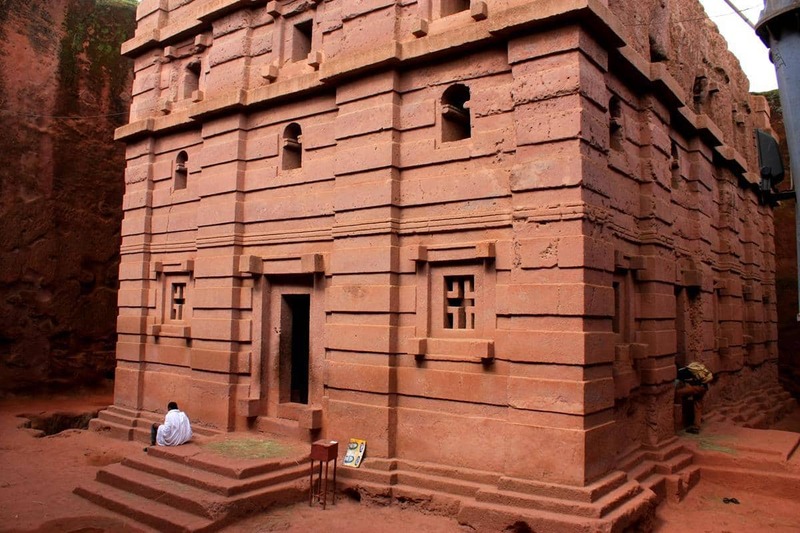 The most famous of the Orthodox Lalibela churches is Bet Giyorgis, which stands discrete from the two main clusters of churches. It is also the only one that was chiselled out from above. Bet Giyorgis is the only church that was chiseled out from above. 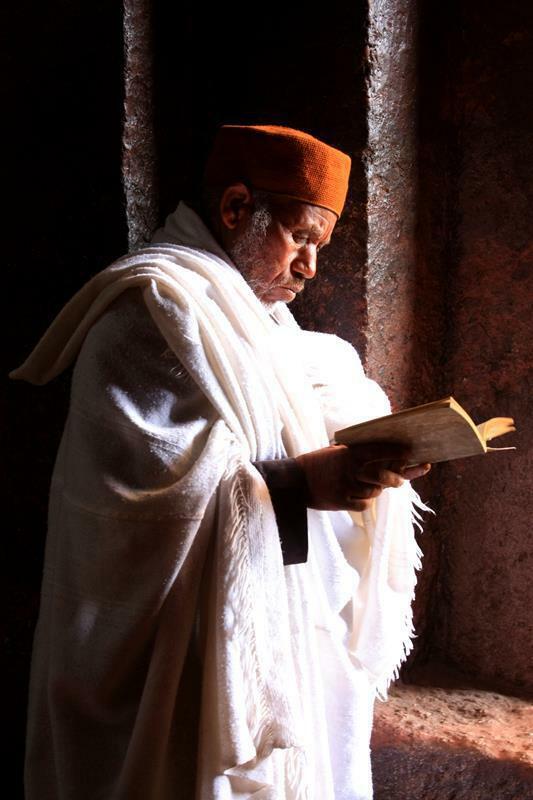 There are about 800 priests, nuns and monks devoted to these 13 churches and the people of Lalibela are seriously devoted Christians. The priests spend most of their day reading the bible. Next we descended sharply north-west towards Mekele through some jaw dropping scenery. Initially the terraced hills were covered in different shades of green and as we drove on, the earthy colours of the now rocky cultivated terrain blended beautifully with the green hues. Earthy colours blending with greens. It was again difficult to find a suitable place to bush camp and we were extremely happy to come across a most beautiful spot overlooking a valley 500m below. The sheer, orangey cliffs fell away just a few metres from us towards a river far below and then rose to distant rock walls and square towers. The spectacular view from our wild campsite. 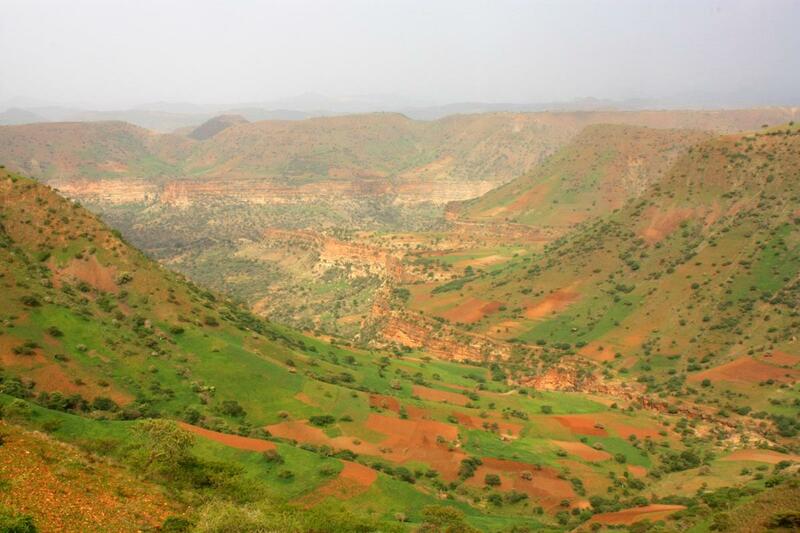 Ethiopia has such a variety and profusion of landscapes and sheer beauty that each day we would repeatedly exclaim in wonder! It is certainly comparable to the best of Europe and those few special areas of South Africa, like the Drakensberg and Blyde River Canyon. This beauty far outweighs the discomfort caused by the curiosity of the people, mostly children. We are now used to them invading our private space and their wide-eyed intrigue is quite charming. 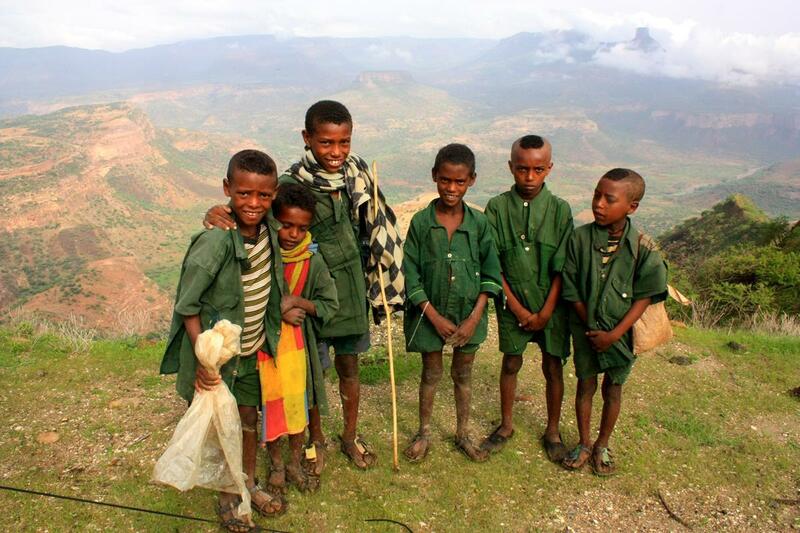 These curious Tigray boys (note their traditional wear) spent hours at our bush camp. Whatever begging takes place usually doesn’t appear to be too seriously motivated. On driving past people with begging hand gestures accompanied by solemn faces, I smile at them and wave energetically. More often than not their expressions change to smiles and waves. We have found that it is a great country to tour (in spite of the fact that they don’t cater for campers) and have had some very pleasant interactions with the few people we’ve encountered who could speak English. Having said that, the loud and rather aggressive sounding ‘You’ or ‘Farangee’ (foreigner) can be quite annoying. However, we have learnt to repeatedly reply with ‘Habesha’, which means Ethiopian. On the third rapid repeat of this, in the same tone as theirs, they usually smile, back off and lose interest. As we neared Mekele, the vegetation dried out and we passed through a valley with the north African version of the Baobab, with stunted branches and green leaves. Rock is plentiful in the Tigray region through which we were now passing and used for building picturesque stone cottages, walls and terraces. Although it was drier and less mountainous, the hilly countryside was charming. The Tigray women are comely, having a distinct hairstyle, wearing beautiful dresses and scarves and are often seen with colourful umbrellas. We have come to enjoy the Ethiopian cuisine. The basis is injera, which is made from tef. It is cooked up into a very large, thin, soft, foam rubber textured pancake and is served with either beans, meat, fish, chicken or vegetables. Here one eats with the right hand and the injera, slightly sour tasting on its own, is used to enfold the flavoursome food and convey it to your mouth. We especially like the injera with shiro tegamino. Shiro is a paste made from beans, and tegamino a particularly flavoursome variety. We have also learnt that on the Christian Orthodox fasting days (Wednesdays and Fridays, as well as during certain religious festive times) no meat or chicken is served. Captivated by what Ethiopia had thus far offered, we were next looking forward to a four-day excursion to the Danakil Depression which is well below sea level and renowned as the hottest place on earth…. The best part of our day, when we open up the computer, is to see a New Blog with stunning photos and fascinating stories. Arm Chair travelling at its best! Facinating stuff, guys! Really enjoying the blog, Karin, and the pics are great, Pete. 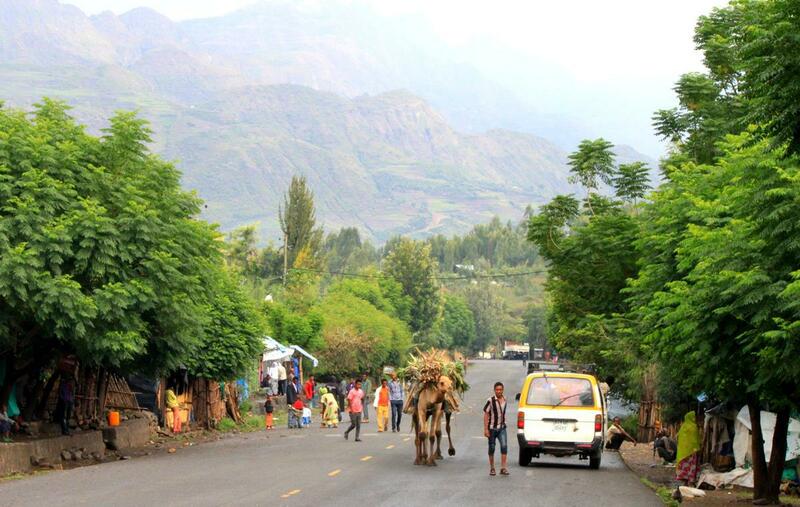 Wow it looks awesome , seems like lots to see in Ethiopia . Hope your over the punctures . Travel safely . Hi Karin & Pete, thank you for the memories. It is still ringing my ears “You You” and “Money Money” enjoy your trip. May God blesse you and protect you. You really are taking us along with you on this trip with your beautiful photos and descriptions of what you see and experience! I wonder how long it took the builders to complete one of those churches? Are there any estimates or knowledge about that? It certainly required a huge amount of very hard work.